Kinetic processes during absorption, distribution, metabolism and excretion determine the extent of drug activity. 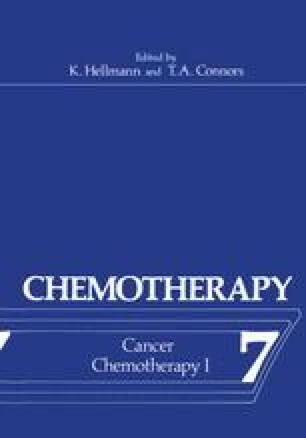 The success of cancer chemotherapy is particularly dependent upon a series of dynamic events, such as pharmacokinetics, cell cycle kinetics, target enzyme activities, dosage schedule and sequence in combination therapy, and kinetics of endogenous metabolites. Pharmacokinetics therefore, should represent an integral part of pharmacological and clinical studies. Anticancer drugs present special problems in pharmacokinetic investigations. The very nature of their mechanism of action often requires interaction of the drug with specific anabolic and catabolic enzymes in addition to interaction with the hepatic microsomal drug metabolizing enzyme system. Exploitation of enzyme differences between normal and neoplastic tissue may be important in drug efficacy. This demonstrates the complexity frequently encountered in pharmacokinetics of antineoplastic agents. Every single agent may require an entirely different approach to yield useful data. The following information can result from pharmacokinetic studies.